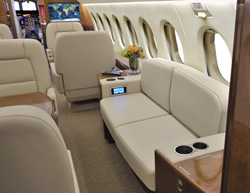 In six years, this Falcon 900 interior refurbishment will be reaching the end of its lifespan. Maintaining the seat coverings, replacing carpet and recovering the lower sidewall panels can give it a new look on a smaller budget. Over the past two years, interior trends have shifted away from complete aircraft refurbishments to partial, more budget-friendly updates. However, identifying what needs to be done and when can be a challenge, especially for owners and operators seeking a new look with a smaller budget. Required maintenance events are an ideal time for interior updates, particularly if finishes are reaching the end of their lifespan and are due for replacement. I strongly recommend keeping in mind when the next required downtime is scheduled, what parts of the interior can be addressed during that downtime and where the largest costs are involved. With proper planning, an interior can be given a fresh look on a smaller budget without extending downtime. If the seat material is in serviceable condition, it can be cleaned. Leather can also be redyed. This improves the seat appearance at a fraction of the cost of replacement. Floor coverings are independent from most interior items, making it quick and easy to replace. With the help of a professional designer, carpet can complement future softgood replacements. 3. Recover lower sidewall (dado) panels. Updating the panel material is also a straightforward process, and when combined with seats and carpet it can go a long way to achieving a fresh, new look. An aircraft interior can also be updated over the course of several maintenance events, spreading the cost over multiple years and reducing the total downtime. George Bajo is a Completions Sales Representative at Duncan Aviation-Battle Creek, specializing in interior and paint refurbishments for Challenger, Embraer, Gulfstream, Learjet and Astra / Westwind aircraft. He began working in aviation in 1984.